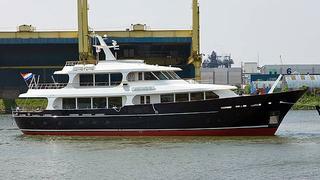 The 33.4m motor yacht Heliad II was launched yesterday by the Dutch yard Lynx Yachts. Built far from the spotlights during the two last years, Heliad II is a modern classic yacht with a naval architecture and an exterior styling by Diana Yacht Design. The interior, by Weber Yacht Design, accommodates 10 guests in a master suite, two VIPs and two double staterooms. Crew quarters are for five in three cabins. Lloyd's registered and MCA compliant, Heliad II is powered by twin Caterpillar C-18 giving a comfortable cruising speed of 13 knots. Lynx superyacht Heliad II has now been launched. Heliad II will be delivered for the upcoming season.